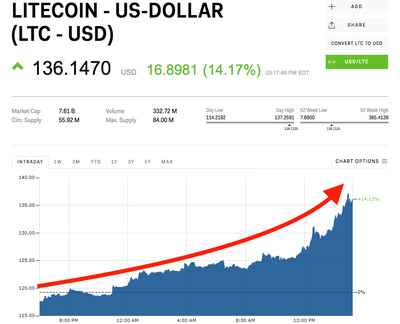 Litecoin gained 15% Tuesday, outpacing most other major cryptocurrencies. Bitcoin was only up 6% in the same period. Crypto startup Abra’s CEO explained his reasons for switching to litecoin for smart contracts in a Reddit AMA. You can track the price of litecoin in real-time here. 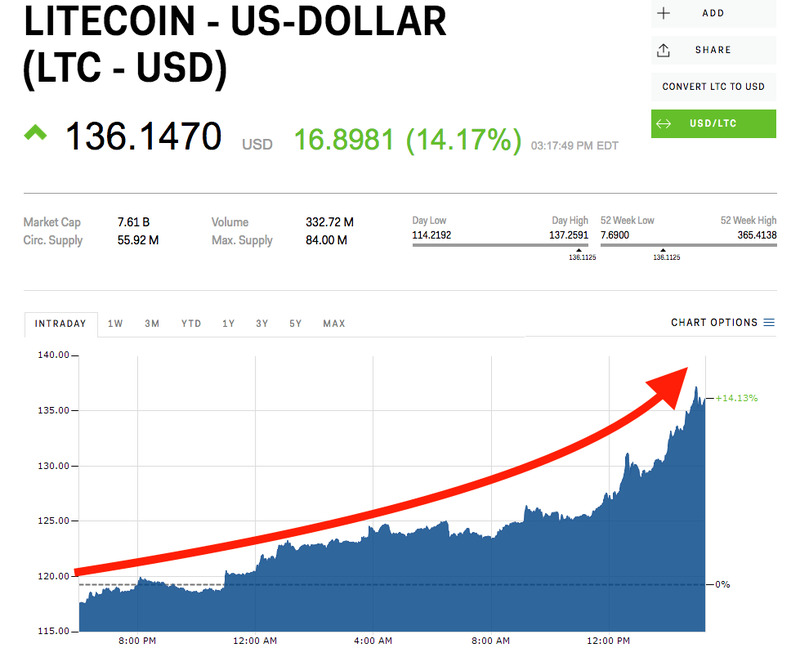 Litecoin rose as much as 15% Tuesday after Abra, a high-profile crypto startup backed by American Express, doubled down on its decision to use litecoin’s smart contracts feature to power the company’s exchange and wallet products. “We went with Litecoin as the second asset class, after bitcoin, for our smart contract investing solution for 3 primary reasons: 1. commitment to bitcoin compatibility: core roadmap, p2sh support, lightning support, etc; 2. slightly better scalability than bitcoin in short term (block size and block times); 3. mining fees which are primarily a function of #2 although this is more of a short term benefit as mining fees would likely sky rocket if we’re successful anyway!,” Abra CEO Bill Barhydt said in an “ask me anything” on Reddit Monday afternoon. The shift was first announced at the end of March, but gained more attention following Barhydt’s AMA on Monday. Abra has raised $US40 million in funding so far, including an undisclosed amount from American Express, Fidelity’s venture capital arm, and Foxconn, the Asian manufacturer of parts for Apple. It also recently expanded its offering from bitcoin and ethereum to its current suite of 70 crypto and fiat currencies earlier this month. In an interview with Business Insider in March, Barhydt said the crypto market will boom once again in 2018 as appetite grows for so-called altcoins.